McClain’s Luke Sanchez works along the sideline against Hillsboro’s Hunter Hice on Tuesday at Hillsboro High School where the Tigers battled the Indians in a FAC soccer showdown. Hillsboro’s Emily Hawk advances the ball past midfield against McClain’s Emily Grate at Hillsboro High School on Tuesday where the Lady Indians took on the Lady Tigers in a FAC matchup. 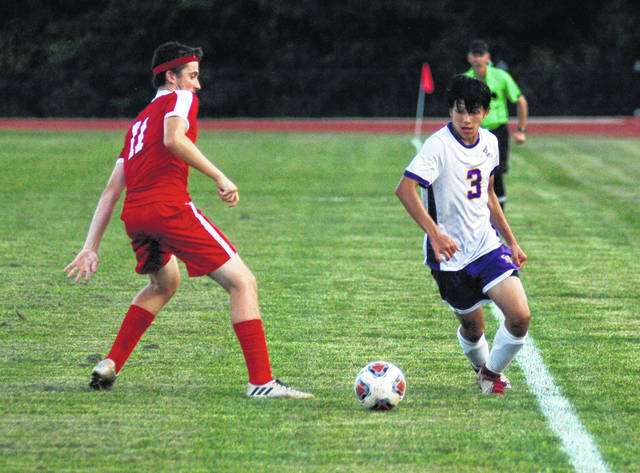 Hillsboro’s boys and girls soccer teams hosted the McClain Tigers and Lady Tigers on Tuesday at Hillsboro High School in Frontier Athletic Conference matches. The boys teams were the first to take the field and appeared to be evenly matched for much of the first ten minutes as each team probed the opposing defense in search of a weakness. Hillsboro was the first to strike as Quinn Conlon corralled a rebound and sent the ball screaming past McClain keeper Noah Reeves at the 28:50 mark to give the Indians a 1-0 lead. The Tigers had chances to put the ball in the back on the net following the Conlon goal as shots went to the left, the right and hit the crossbar to hold the score at 1-0 in favor of Hillsboro. The Indians registered their second goal of the first half as Hunter Hice netted one off of an assist by Logan Crafton at the 22:43 mark. Over the course of the ensuing 22 minutes of play the Tigers and the Indians each had chances to put the ball in the net but were unable to convert. That changed in the final minute of the half as Andrew Gunderman flashed to the middle of the field and received a pass from Ethan Hatfield on the right side. Gunderman calmly gathered the ball and scooted it past Reeves for the third goal of the half for the Indians and Hillsboro went into the halftime break with a 3-0 lead. To start the second half the teams traded possession several times without either team gaining an advantage over the other. Finally, at the 27:30 mark of the second half, McClain was able to break into the scoring column as Luke Sanchez used his fancy footwork and impeccable timing to send one by Hillsboro keeper Rory Foley and give hope to his teammates as they trailed 3-1. Lyle White got in on the action with 18:26 to play as he received a pass at the top of the box and sent the ball rolling into the net without ever turning around. White’s goal got the Tigers to within one goal at 3-2 and energized the McClain players. with 3:35 to play in the match Conlon sent a ball past Reeves and into the net on a free kick to extend Hillsboro’s lead to 4-2. The Tigers ferociously attacked the Indians’ defense as they scrambled to make up the difference. Evan Hutchinson was finally able to break the Hillsboro line and beat the keeper at the 1:31 mark of the second half but it was not enough as the Indians were able to hold the Tigers at bay for the 4-3 win. 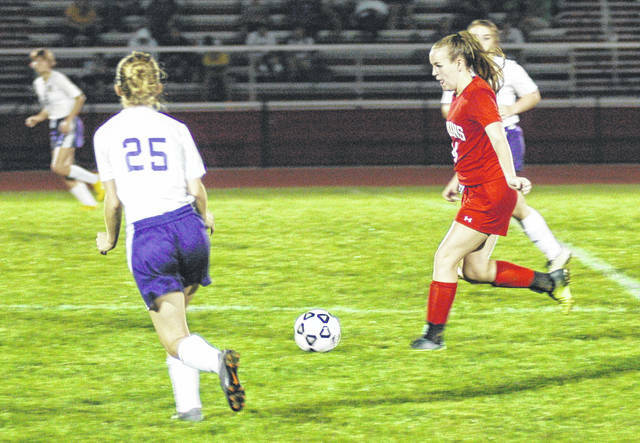 The girls match held much less drama for the gathered crowd as the Lady Indians cruised to a 6-0 win. Callan Meyers recorded two goals in the first half of play and Sami Blair added a third to give Hillsboro a 3-0 cushion at the half. Emily Hawk got in on the action at the 28:28 mark of the second half to extend Hillsboro’s lead to 4-0. Stephanie Patton added the fifth goal of the night off of a header and Meyers finished off the hat trick late in the half to give Hillsboro their final goal of the half and secure the 6-0 win for the Lady Indians. The McClain boys and girls will be back in action as they host Jackson this evening in FAC competition. Hillsboro will travel to Washington Court House on Thursday to take on the Blue Lions in FAC matches.